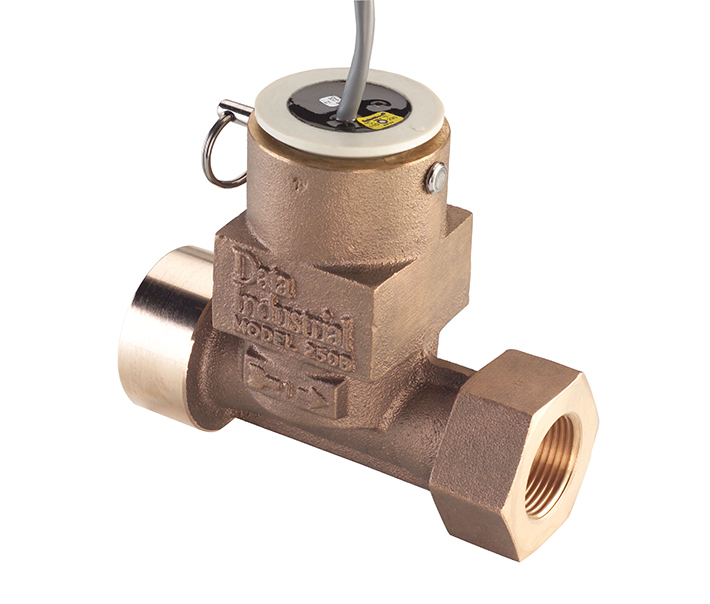 The Series 250 flow sensor features a six-bladed impeller design with a proprietary non-magnetic sensing mechanism, mounted in a cast bronze housing, with female NPT threads. The unique impeller design is less prone to be fouled by waterborne debris. The forward curved shape coupled with the absence of magnetic drag provides improved operation and repeatability even at lower flow rates. This is especially true where the impeller is exposed to metallic or rust particles found in steel or iron pipes. As the liquid flow turns the impeller, a low impedance square wave signal is transmitted with a frequency proportional to the flow rate. The signal can travel up to 2000 feet (610 m) between the flow sensor and the receiving unit without the need for amplification.